Brazilian architect Oscar Niemeyer celebrated his 103rd birthday Wednesday with the launch of a museum dedicated to his career. The Oscar Niemeyer Foundation outside Rio de Janeiro will house exhibits about the legendary architect’s 70 years of work. Niemeyer is responsible for more than 600 modernist projects around the world. They include the sweeping concrete structures that house Brazil’s government in the capital, Brasilia, and U.N. headquarters in New York. 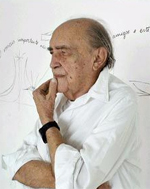 Niemeyer is still working and has won numerous awards, including the Pritzker Architecture Prize in 1988. There is a significant commerical building by Niemeyer right here in the Times’ backyard, of course. The former Beauty Pavilion, at 8760 Sunset Blvd. on the Sunset Strip, was commissioned by a famous plastic surgeon in the 1960s and is still in use as the headquarters for Mutato Muzika, a music production company that scores television shows and movies owned by Devo frontman Mark Mothersbaugh. The building’s original white finish has been painted a traffic-stopping chartreuse, which could well be a tad too post-modern for the great modernist architect’s tastes.